After many years of trying, Orville and Wilbur Wright succeed in making their heavier-than-air aircraft fly, south of Kitty Hawk, on December 17, 1903. They later try to sell their invention to the US government. I will not provide a complete review as others have done. I am most impressed with the video footage of the early Wright aircraft flying. 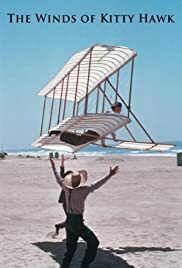 This is an excellent story of the Wrights and not soon to be recreated since many of the scenes were shot using a series of replicas of the Wright's gliders and aircraft and some were built and flown with the help of NASA. NASA released some of the details in the 1970s. Some of the replicas were tested in NASA wind tunnels. This film is the only place you can go for historically accurate video footage of Wright aircraft flying. This is a historically important film and should be reproduced on DVD. A couple other notes; other have said that Michael Moriarty's portrayal of Wilbur Wright was 'wooden' or less than an award winning portrayal. Based on my extensive readings of Wilbur, the damage to his teeth and jaw during hockey games, his quiet and introspective nature, I am not at all certain that the portrayal is inaccurate at all. He was said to be stoic, quiet, and rarely smiled. I would like to see more on the accuracy of the portrayals of Alexander Graham Bell and Glen Curtis.